The symbols of Myanmar have long and fascinating histories and traditions. Steeped deep history, these can still mean many things for the Burmese of today. The modern world has recently been thrust on Burma and the new air of an independent people, so long cut off from the world’s prying eyes, is ready to open up to international influences. The symbols of the people of Burma will not have a more significant meaning than they have today, so let’s look at what we are soon to learn from the hospitable and wise folk of this ancient civilisation. First of all we should mention the reasons behind the new flag as it has only been in place since 2010 which signifies the rapid changes the country is currently going through. Don’t expect to see this everywhere yet but if you look keenly you should notice the yellow green and red horizontal stripes representing solidarity, peace and tranquility and courage and decisiveness respectively. There will be a striking white star centrally overlaying these colors. This new emblem replaces the former flag that was used from 1974. This version will be noticed more often and features a red body with a small blue rectangle in the top left corner presenting a gear mechanism, a rice grain and a circle of stars all in white. The gears are 14 in number representing the regions. Interestingly the State Seal also uses the gears and a corn ear together with a map of Myanmar but the whole piece is flanked by two protective lions which have their own symbolism in the national psyche. The White Elephant is much revered in Burma and enjoys a royal status for local beliefs and customs. They are purely a symbol of peace, power and prosperity. Although their numbers have inevitably reduced over the years the modern day white elephant, although slightly reddish and pink in color, is seen throughout the land as a symbol of good luck. 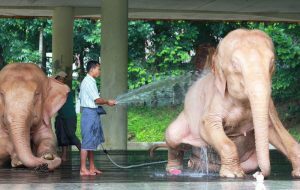 Even the monarchs of Burma, when in possession of these fine beasts, have the honor of being known as the Lord of White Elephants or Hsinbyushin. It is believed that Buddha once took the form of a white elephant, so it is easy to see how strong this link is for the people. The importance of the tradition is kept alive by tributes such as white elephants adorning modern bank notes for 20, 200 and the new 5,000 kyat notes. The Green peacock known locally as Daung is also much revered and even to this day the golden fighting peacock proudly sits on top of the party political flag of Aung San Suu Kyi. The peacock is officially recognized as symbolizing compassionate watchfulness as has a place in Buddhist mythology. The green peafowl version was a long standing symbol adorning the flag and coins of the Konbaung Dynasty (100-1885) and has since become a popular figure for the country. A dancing peacock appeared on many different flags between the formative years of 1930 to 1948 when it was transferred to bank notes up until 1966. The National League for Democracy or the NLD party as previously mentioned uses the fighting green peafowl with a tufted crest. The guardian lions as depicted upon the flag and State Seal are called the Chinthe, pronounced “chin-thay”, and they have been famous since their background as mythical lion-like creatures. Being also revered greatly through Myanmar’s rich heritage they can be seen in many places guarding temple entrances and royal thrones and have recently been adopted by the recent military governments. They only made their introduction onto bank notes as late as 1988 but long ago were seen proudly smelted as figurines used as brass measuring weights. The Chinthe come for an ancient story of a princess banishing her lion husband. Their son, unaware of this, slayed the lion and became full of remorse when hearing the truth. To atone for his sin he built a lion statue to be the temple guardian and the myth has found its way through the national culture ever since. You will see many guardians on important buildings and as with all artifacts and relics of other cultures, when respecting the history attached you can only be impressed by their meaningful origins.